A complete 6-Channel Portable PA system for rent for weddings, corporate events, parties, auctions, or whatever small gig you have planned. The system includes two high-quality sound microphones, dual-mode USA receiver with built-in Bluetooth wireless connection for music streaming with a range up to 400, and two mini-adjustable speaker stands. Receiver can be connected directly to your PC, MAC, IPOD, or MP3 player. 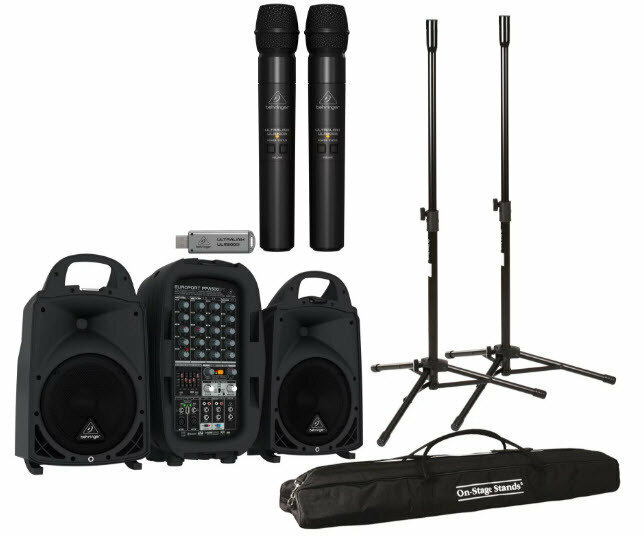 Includes two speakers, two speaker stands with easy portable speaker bag. Be your own DJ! A complete 6-Channel PA system for rent for weddings, corporate events, parties, auctions, or whatever small gig you have planned. The system includes two high-quality sound microphones, dual-mode USA receiver with built-in Bluetooth wireless connection for music streaming with a range up to 400, and two mini-adjustable speaker stands. Receiver can be connected directly to your PC, MAC, IPOD, or MP3 player. Includes two speakers, two speaker stands with easy portable speaker bag. Only $110.00 for weekend rental! Pick Up Rental Only - Iowa!